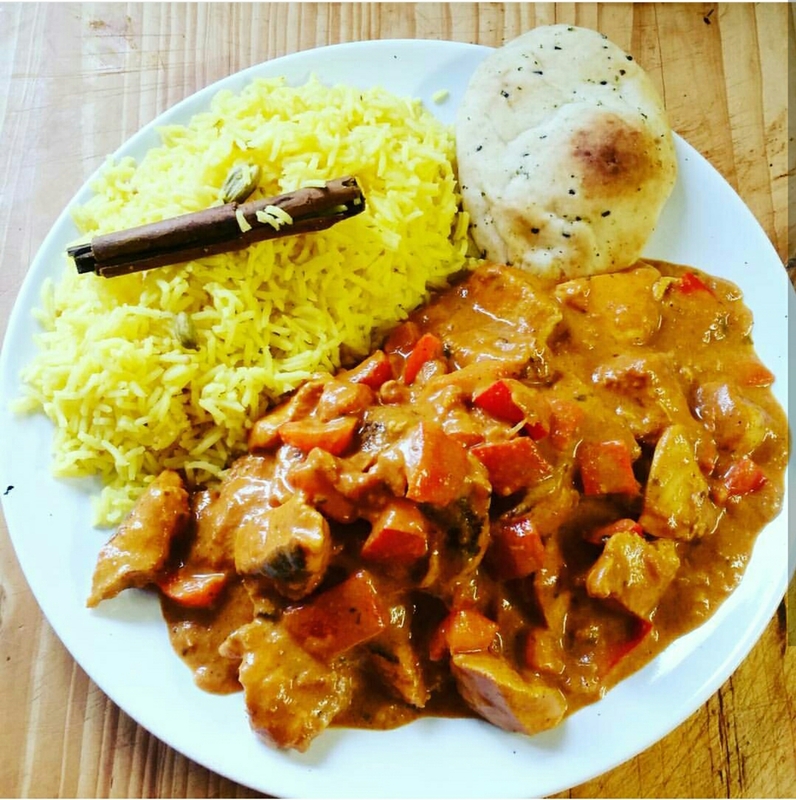 Indian Chicken Tikka Masala with Fragrant Pilau Rice! I adore Indian food, but when your trying to drop the pounds the calories begin to add up pretty quickly even when ordering a tomato based dish! So why not forget calling the local curry house for your weekly takeaway and try my easy peasy Tikka Masala Fakeaway. Indian food can be quiet daunting from the marinades to the sauces rice dishes and breads. But I promise with a little plan and prep your curry will ready in minutes! 1 medium white onion, diced. 2 Bell peppers, chopped and diced. 2 large garlic cloves, crushed and chopped. In a small food processor, whizz together 5 garlic cloves, 1 large knob of fresh root ginger, roughly chopped, 1 red chilli, deseeded and roughly chopped, 2 tsp each ground cumin and coriander, 1 tsp each turmeric, paprika and garam masala, and the seeds from 4 cardamom pods. Add a little water or vegetable oil to bring the paste together. Can be stored in the fridge for up to 1 week or frozen for up to 1 month. 1 tsp of dried garlic. large handful of roughly chopped fresh Parsley or coriander. 4 heaped tbsps of Quark or 0%fat free natural Greek yogurt.I use Glenisk’s natural greek yogurt. 150ml of cold tap water. Salt and freshly ground black pepper to season. Add the diced chicken to storage container place all of the above ingredients and mix well. Seal and marinate the chicken overnight or for at least 2 hours in advance. 1. Spray a large, deep non-stick frying pan with low cal cooking spray or your preferred oil of choice, adding the diced marinated Chicken and frying until golden in colour. You may need to do this in batches as you want the chicken to fry not stew. I have also cooked the chickem on skewers under the grill or on my George Forman grill to give that lovely tandoori charr! 2 Add the onions and fry for 2 minutes, adding a little water if they start to stick.I then add the Curry Paste 2 cans of chopped tomatoes, tomato puree, stock cube and 150ml of water and simmer for further 10-15 minutes until the sauce has reduced and thickened. 3.Add the chopped Red pepper, and cook for a further 5 minutes. 4. Your sauce should be lovely and thick so you can take the pan off the heat, stir the yogurt into the curry and season to taste. 5. I like to serve it with boiled Pilau rice (for the pilau rice I add 1 tbsp of turmeric, 4 cardamom pods and a stick of cinnamon to approximately 80g of dried wholegrain basmati rice per serving and boil as normal) I like to add lots of water so the grains have space to move and not stick together. I drain the rice and leave in a colander covered with a teatowel to steam while I prepare my curry. It is always my choice with any Indian curry and my favourite steamed seasonal vegetables or a big Salad. 6. Also you can find now in supermarkets low calorie poppadoms or Naan breads which as so delish to accompany the dish. TIP ➡To safely freeze, cool the curry as quickly as possible, then freeze as soon as it’s completely cooled. Divide into freezer-proof containers, or use takeaway containers. To avoid freezer burn, make sure all chicken pieces are well covered with sauce. This curry will freeze well for up to 3 months. Defrost overnight in the fridge. Once thoroughly defrosted, reheat gently to prevent yogurt from splitting. Make sure it’s piping hot all the way through before serving.